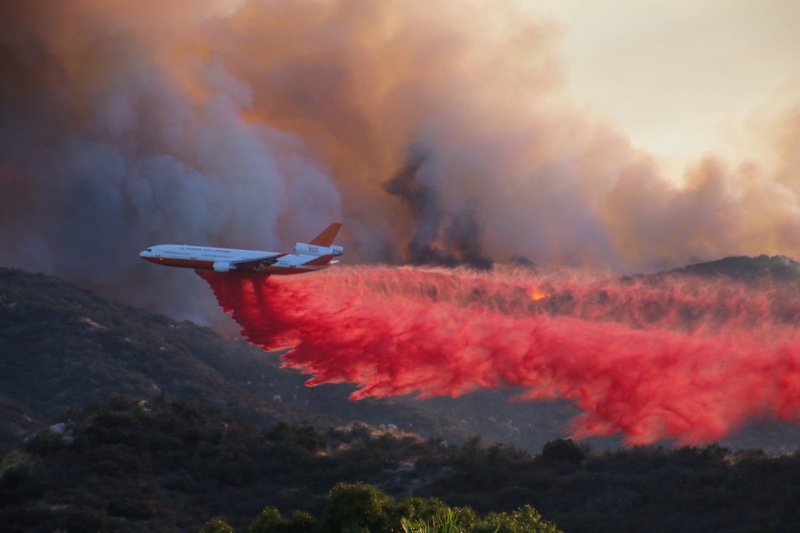 Tankers continued to drop fire retardant chemicals on the Wildomar Fire on Friday. Fire officials announced Saturday they have 60 percent containment of the Wildomar Fire, which has burned 850 acres since it started Thursday afternoon. Evacuations for residents in the La Cresta and Bear Creek neighborhoods of west Murrieta and Wildomar were lifted Friday and all roads are open. Recreational activities are prohibited in the fire area, according to the Riverside County Fire Department. About 200 residences were evacuated Friday morning, including many horse and other animals. Hundreds of homes were threatened but none were damaged. All roads were re-opened by 6 p.m.
Fire officials said residents may continue to see smoke coming from the burn areas until the fire is fully contained. During a reporter's drive along Grand Avenue in Murrieta, Wildomar and Lake Elsinore Friday afternoon, smoke was greatly reduced and residents were seen returning to neighborhoods. By 5 p.m. Thursday, the fire had moved northeast, spreading over 200 acres and forcing evacuations of five residences along Hixon Truck Trail. By 8 p.m., 350 acres had burned. As residences packed up to temporarily leave their residences Friday morning, multiple animal control agencies offered shelter for horses and other animals in the area, which includes many ranch homes. Tom Fuhrman of Menifee was one of several local ranchers offering to shelter horses. Fuhrman, a former Menifee City Council member, met with several residents with horse trailers gathered near Clinton Keith Road and the 15 Freeway Friday morning. It was unclear whether any of the displaced horses were taken to his Wooden Nickel Ranch. Other Menifee residents offered horse sheltering on social media.